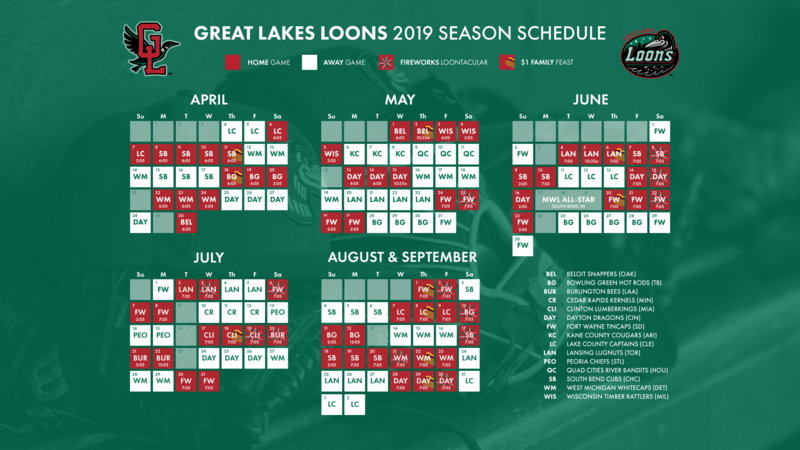 The Great Lakes Loons are a Single-A Minor League Baseball affiliate of the Los Angeles Dodgers. Founded in 2007, the club is a member of the 16-team Midwest League and won its first championship in 2016. On January 12, 2006, a group of regional community leaders led by former Dow Chemical Company CEO William Stavropoulos, announce the formation of the Michigan Baseball Foundation to bring Minor League Baseball to the Great Lakes Bay Region. One week later, MBF signs a purchase agreement with the Southwest Michigan Devil Rays. Six months later the purchase is finalized, paving the way for the team to be relocated from Battle Creek to Midland, Mich. Over 50,000 tickets are purchased for the inaugural season on the first day of sales and the team plays in front of a capacity crowd of 5,454 for its first home game on April 13, 2007, against the Lansing Lugnuts. Dow Diamond is home to the Great Lakes Loons. Constructed in just 367 days, the ballpark was designed by HOK Sport (now Populous) and built by the Three Rivers Corporation. In addition to hosting 70 Loons home games every season, the stadium has hosted over 1,000 special events including both the 2008 and 2017 MWL All-Star Games, major concerts, corporate events, formal dinners and receptions, and other functions. After the 2017 season, the ballpark received its largest reinvestment since it opened with $3 million in improvements including the fifth-largest videoboard in the MiLB, two HD ribbon displays, the opening of the retro-theme "Glory Days" apparel store, and a remodel of the Lou E's Lookout playground area. Tickets can be purchased anytime on Loons.com. William Stavropoulos, former CEO and Chairman of The Dow Chemical Company, is chairman emeritus of the Board of Directors of The Dow Chemical Company, Midland, Michigan. His career with Dow spanned 39 years, serving in a variety of positions in Research, Marketing and general management. He served as president and chief operating officer from 1993-95; president and CEO from 1995-2000; chairman and CEO from 2002-2004; and chairman from 2000-2006. Stavropoulos was a member of the Board of Directors of Dow from July 1990 to March 2006. He is founder of the Michigan Baseball Foundation and the Great Lakes Loons. Stavropoulos holds important positions in the business and non-profit world. He currently serves on the boards of three corporations (Univar, Inc; Teradata Corporation; and Kissner Holdings) and two non-profits (Artis-Naples and the Forum Club of Southwest Florida). He is on the advisory board of Metalmark Capital, LLC. He also is a Advisor of the Board of Fidelity Equity and High Income Funds. He is also a long-standing member of the Science Advisory Board of the University of Notre Dame. Stavropoulos is past chairman of the American Chemistry Council, Society of Chemical Industry, and American Plastics Council. He is a past Board member of Maersk Inc and Tyco Inc.
Stavropoulos received many honors throughout his career, including: 2010 named an Archon by His All Holiness Ecumenical Patriarch; 2010 inducted into the Midland County Sports Hall of Fame as a "Professional Baseball Visionary," 2007 Northwood University Naegele Distinguished Community Service Award; induction into Junior Achievement of Central Michigan's Business Hall of Fame in 2005; Northwood University's 2004 Outstanding Business Leader Award; Institutional Investor magazine's award as one of the Best CEOs in America in the category of Chemicals/Commodity (1999, 2003, and 2004); 2003 Society of Plastic Engineers Annual Business Management Award; Société de Chimie Industrielle's 2001 Palladium Medial Award; 2001 Chemical Industry Medal Award from Society of Chemical Industry; The Man of the Year Award from the Hellenic American Chamber of Commerce in 2000; CEO of the Year Kavaler Award in 1999; honorary Doctor of Laws degree from Northwood University in 1998; the Ellis Island Medal of Honor in 1998; The Man of the Year Award from Hellenic American Bankers Association in 1997; The Man of the Year Award from the American Hellenic Education Progressive Association in 1995; and an honorary Doctorate of Humane Letters degree from Fordham University in 2018. Stavropoulos holds a Bachelor of Science degree from Fordham University and a doctorate in medicinal chemistry from the University of Washington. He and his wife, Linda, make their home in both Midland, Michigan and Naples, Florida, where they are both very much engaged in community and charitable activities. Family is also an important focus of their attention. They enjoy the time they can spend visiting and travelling with their two adult children and six grandchildren. Scott Litle is the Loons Senior Vice President and General Manager. In this role, Litle oversees the day-to-day operations related to the team's affiliation with the Los Angeles Dodgers, its coaching staff, and its Midwest League partners. He also has a large management role with ESPN 100.9-FM. Litle previously served as the Loons Vice President of Sales and Event Operations. Under Litle's leadership as Assistant GM of Ticket Sales & Event Operations, the Loons sold over 300,000 tickets in each of the Loons first two seasons, and over 270,000 tickets in 2009, which were well above the organization's stated goals and projections. Scott joined the Loons in 2006 after serving as an assistant GM for the Tri-Cities (WA) Dust Devils (Short Season, Northwest League). Prior to joining the Dust Devils, Litle worked with current Loons President Paul Barbeau with the Spokane Indians (also of the Northwest League) as an account executive and later as director of ticket sales. Both teams are owned by Brett Sports. Litle has established himself as a leader in the Mid-Michigan community. He currently sits on the board of directors for Big Brothers Big Sisters in the Heart of Michigan and the Arnold Center, and is a board member for the Midland Area Chamber Foundation. Scott completed the Great Lakes Bay Regional Alliance Leadership Institute, which aims to acquaint identified leaders in the GLBR with a regional perspective. Plus, he has been selected to appear at numerous community organization gatherings to speak on behalf of the Loons. In 2015, Litle received the Ruby Award from Great Lakes Bay Regional Lifestyle Magazine, an honor recognizing young professionals in the Great Lakes Bay Region. Litle is a 1999 graduate of Montana State-Billings where he received his bachelor's degree in management. Litle resides in Midland with his wife, Heather, and daughters Makayla and Jordyn. He enjoys spending his free time playing tennis and golf. Chris Mundhenk, the Loons Vice President of Business Development, has spent 14 seasons in the sports and entertainment industry. In his role, Chris oversees all facets of sales and corporate partnerships for the Loons, Dow Diamond, ESPN 100.9-FM and the Michigan Baseball Foundation. Chris joined the Loons in 2006 as the Loons Assistant GM of Marketing & Promotions. Under Mundhenk's leadership, the Loons enjoyed a successful inaugural season, entertaining over 324,000 fans in 2007. Chris played a key role in Dow Diamond hosting the 2008 Midwest League All-Star Game. The event featured a Hometown Hitter Competition, a Swing With the Legends Golf Tournament, an All-Star FanFest, the MWL Home-Run Derby and the MWL All-Star Game. Over 11,000 fans attended the Home Run Derby and All-Star Game events that took place June 16-17, 2008. Prior to the Loons, Chris served as the Director of Promotions and New Business Development for the Altoona Curve and State College Spikes. During his three seasons in Altoona, Chris was part of an organization that won the Larry MacPhail Promotional Trophy (2004), awarded to the team having the top promotional effort in Minor League Baseball; received the John H. Johnson President's Trophy (2006), Minor League Baseball's top award presented annually to honor the complete baseball franchise; hosted the Eastern League All-Star Game (2006) and launched a brand new franchise in State College (2006). Chris spent nearly four years with Brett Sports & Entertainment as the Director of Ticket Sales and Assistant GM of the High Desert Mavericks Baseball Club and Director of Promotions for the Spokane Chiefs Hockey Club. Since arriving in Mid-Michigan, Mundhenk has taken an active role in the community. He is a member of the steering committee of the Midland Downtown Sculpture Series, a member of the marketing advisory committee of the Midland County Educational Service Agency (MCESA), a member of the Midland Advertising and Marketing Professionals (MAMP), a member of the Midland Downtown Development Association's Creating Cool Committee and a regional judge for DECA, an association of high school marketing students. He is a native of Portsmouth, Ohio, and holds a bachelor's degree in business administration and a minor in sports management from Otterbein College in Westerville, Ohio. He lives in Midland with his wife Nellie and their daughter Tatum, as well as their two dogs - Sully and Scout. Jana Chotivkova serves as the Loons Chief Financial Officer. She oversees all financial operations at Dow Diamond, including the Michigan Baseball Foundation, the Great Lakes Loons and ESPN 100.9-FM. Jana came to the Loons after spending 12 years in the public accounting sector. She most recently served as the Senior Manager at Yeo & Yeo, where she supervised auditing teams for non-profit groups of Midland and Saginaw. Chotivkova is from the Czech Republic. She majored in accounting at Northwood University and graduated in 2000 with a Bachelor's degree in Business Administration. Jana lives in Midland with her husband, Pavel and their son, Benjamin. Jana spends her free time traveling and enjoying the outdoors, including mountain biking and hiking. She also enjoys spending time with family and working on home improvement projects. Jay Arons is the Director of Sales for ESPN 100.9-FM. In this role, Arons responsible for all radio sponsorships and sales, as well as maintaining relationships with the station's partners. No stranger to sales, Jay has been selling radio advertising nearly 20 years. Prior to joining ESPN 100.9-FM, Arons spent 10 years with Citadel Broadcasting as an account executive, working with local, statewide and national clients. While studying at the University of Georgia, Arons earned his bachelor's degree in journalism. Jay has established himself as a leader in the Mid-Michigan community. Arons is the co-chair for Midland County Youth Leadership, Alden B. Dow Museum of Science & Art Council advisory board, a member of Leadership Michigan (2010), Leadership Midland (2007). Born and raised in Atlanta, Georgia, Jay lives in Midland with his daughters Alex and Ashley. He enjoys tennis, hiking, running, snow skiing, and boating. It brings him great pride being a positive role model for his daughters. Jay's motto: "Live Everyday with Love and Peace"
Cameron joined the Loons staff in January 2019 as the Promotions Manager. Andrew Booms serves as the Concessions Manager as a part of Professional Sports Catering Powered by Levy Restaurants. In this role, he's the main contact for non-profit groups volunteering in the Northern Lights Pavilion areas. He also is the direct supervisor for all concession stands and portables. Andrew is no stranger to Dow Diamond. He worked four years in seasonal hourly positions, including warehouse supervisor. He is currently working on his Business Management degree from Northwood University. A Freeland High School graduate, Booms' hobbies include hunting, snowmobiling and bowling. Matt DeVries serves as the Assistant General Manager of Marketing and Communication for the Loons and ESPN 100.9-FM. He manages all marketing and direct communications efforts for the companies, along with overseeing content on all web pages, social media channels and in print. In his role with the radio station, he serves in an advisory role and oversees its digital properties. Matt has previously served in a variety of roles with the organization including Communications Manager for the Loons, Content Manager for the Loons, Program Director for ESPN 100.9-FM and General Manager for ESPN 100.9-FM. He also was the producer of "CrunchTime" on the local station. Prior to his full-time roles within the company, he served as a Communications Intern for the Loons during the 2013 season. Under Matt's leadership, the Loons were named one of Minor League Baseball's Top 15 media relations departments during the 2016 season by MiLB.com. They were one of two Los Angeles Dodgers affiliates to be recognized (Triple-A Oklahoma City) and the only team from the Midwest League on the list. Matt was also part of the group that earned ESPN 100.9-FM the recognition of "Station of the Year" from the Michigan Association of Broadcasters in 2017. He's a proud alum of Central Michigan University ('13) and worked with the Chippewa football program as a student manager during the 2011 season. Prior to his time in Mt. Pleasant, Matt worked on the sports desk at the Grand Rapids Press and MLive. During that time, he was a volunteer soccer coach at Grandville High School, where he also attended as a student. Matt currently serves on the board of directors for Family and Children's Services of Mid-Michigan, the Energize Bay Area Young Professionals Network steering committee, the United Way of Midland County communications community, and is the chair of the marketing committee for the Energize Bay Area Young Professionals Network. From Grand Rapids, Matt lives in Midland and enjoys the sports scene in the Great Lakes Bay Region. You can find him roaming the concourse or on the field at Dow Diamond during the summer, on ESPN+ commentating CMU men's and women's basketball, or Friday nights hosting "The Offseason Podcast" on ESPN 100.9-FM. He's an avid golfer and big sports fan following the Red Wings, Tigers, Lions, Pistons and Leeds United FC. Trent Elliott serves as the Director of Production for the Loons. He manages the live in-game video and audio production. Trent also handles in-house production, which includes digital graphics, commercials and special events. The Saginaw native graduated from Eastern Michigan in 2012 with a Bachelor of Science in Electronic Media & Film Studies. Elliott started working with the Loons as an intern in 2007, the team's inaugural season and has been a part of the Loons game day staff since 2008 while finishing his Bachelor's Degree. In 2009, he began directing the closed circuit broadcast of Loons games. Trent was named the Production Coordinator prior to the 2013 season. Trent played baseball and football throughout high school. His favorite sports team is the Detroit Tigers. He currently lives in Saginaw and spends his free time playing video games and his drums, along with watching television and movies. Kimberley Emerick serves as the Manager of Retail Operations for the Loons. Kimberley's responsibilities include supervision of retail related functions and management of the Loon Loft. Kimberley joins the Loons coming from a diverse background in retail and business management. Her prior work experience includes 2 seasons at Comerica Park as a retail supervisor, 4 years of retail management in pet/animal welfare related fields as well as 3 years of record label and tour management. She attended Ferris State University for Music Industry Management and during her music business career has worked alongside several musicians including G-Eazy, Matisyahu and Justin Bieber. In her free time, Kimberley likes to travel, watch underground rap battles and compete in Fortnite tournaments. Her interests also include behavioral sciences, animal nutrition, cooking, painting and other various forms of art. Kimberley currently resides in Mount Pleasant with her fiancé Brandon, German Shepherd Apollo and female ragdoll cat Larry. Blake Froling serves as a Play-by-Play Broadcaster for the Loons and ESPN 100.9-FM's coverage of high school football and basketball. Blake also serves as the Content Coordinator for the radio station. Froling, a native of Troy, Mich., comes to the area after serving as the sports director at ESPN UP 970 AM (WZAM) in Marquette. While there he hosted a daily sports talk show "The Sports Pen," provided play-by-play commentary for high school football and basketball, and hosted weekly coaches shows. During his time as a student at Michigan State University, the 23-year-old worked with the Spartan Sports Network and was the sports director for the student radio station Impact 89FM (WDBM). Tony Garant serves as the Director of Group Sales for the Loons. In this role, he oversees all box & lawn and group venues sales including: Lasorda's Landing, Nightly Suites, Northern Lights Pavilion, Pier 47 and Shoreline Box. His time with the Loons dates back to the 2014 and 2015 seasons when Tony worked as a ticket sales associate working at ticket windows on gamedays. In 2016, Tony worked in an elevated role within the ticket office as a ticket sales apprentice assisting in the day-to-day operations of the ticket department. Prior to his current role, Tony was a Group Sales Coordinator for the Loons where he worked with churches, schools and youth organizations in the scheduling of group reserved box and lawn outings. Tony graduated from Saginaw Valley State University in 2016 where he studied business management and athletic coaching. He was a member of the Cardinals' club baseball team during his time at SVSU and also played two years of baseball while attending Jackson Community College. From Alpena where he also attended high school, Tony is a big Detroit sports fan following the Lions, Pistons, Red Wings and Tigers. Dave Gomola serves as Dow Diamond's General Manager of Events. In this position, Dave is responsible for the selling and planning of all functions at Dow Diamond above and beyond Loons baseball. This includes on-field events, such as high school and college baseball games and tournaments, and off-field events, such as parties, receptions, banquets and business meetings. Gomola returned to Mid-Michigan to join the Loons in 2007 from Girdwood, Ala., where he served for 10 years on the management staff of the Alyeska Prince Hotel and Resort, coordinating special events and managing several outlets. Before that, Dave spent two years as a special events intern and restaurant manager at the Big Mountain Ski & Summer Resort in Whitefish, Mont. A native of Warren, Mich., Dave studied commercial recreation and facility management at Central Michigan University. Gomola is a member of the Midland Amateur Sports Capital Committee, a Midland Northeast Little League baseball coach, and a coach in the Midland Area Youth Football League. Dave enjoys all things aviation and has earned his Commercial Multi-Engine Instrument Pilot Rating. He also enjoys hiking, hunting, and fishing, especially in the mountains of Alaska. He has been a lifetime fan of Notre Dame, the Pittsburgh Steelers, Detroit Red Wings and Detroit Tigers. Dave loves spending time with his wife, Stephanie, and two children, Jacob and Maggie. Robin Gover serves as the Business Manager for ESPN 100.9-FM, a position she accepted after working a brief period as the station's Traffic Manager. She is still responsible for radio traffic scheduling as the Business Manager, but also handles all aspects of accounts receivable and accounts payable for the station. Prior to working with ESPN 100.9-FM, Robin served 26 years with WNEM TV 5, where she was in charge of payroll and employee benefit packages, as well as other human resources and accounting responsibilities. Robin worked in the payroll department for the Wickes Corporation shortly after graduating from Delta College with her Associate's Degree in Business Studies and Accounting. Robin, a Saginaw native, graduated from Saginaw High School and currently lives with her husband Mark and her four cats. In her free time, Robin loves to travel and frequents Myrtle Beach, South Carolina. Melissa Kehoe serves as the Administrative Support Assistant. In this role, Melissa helps manage day-to-day operations by assisting the staff at Dow Diamond with any of their administrative needs, as well as providing clients and guests with first class service and a smile. A native of Saginaw, Melissa has a certificate in office administration and an Associate's Degree in Medical Office Administration from Delta College. Her family consists of her husband Neil, daughters Megan and Kaitlyn, son Noah, and three dogs. Melissa's favorite way to spend her time off is any time spent with her husband, while her hobbies include raising sheep on the family's farm. She lists her favorite sports as NASCAR and hockey. Tyler Kring serves as the Director of Corporate Partnerships for the Loons. In this role, Tyler leads all contract activation efforts for the corporate partnership department. He also performs outside sales of new partnerships and serves as the Loons' contact for national advertising partnerships through Minor League Baseball. Tyler has been with the Loons since 2012, serving as an intern from 2012 - 2014 and full-time in the ticket office from 2015 - 2017, most recently as the Director of Group Sales overseeing the sales of hospitality venues at Dow Diamond. Outside of the Loons, Tyler is involved with United Way of Midland County as a member of their Community Impact Panel and Young Leaders United program. Additionally, he is involved in the various chamber of commerce's throughout the Great Lakes Bay Region, including serving as an ambassador for the Bay Area Chamber of Commerce. A native of Cadillac, Tyler is a 2014 graduate of the University of Michigan with a bachelor's degree in Sport Management from the School of Kinesiology, and a minor in business from the Stephen M. Ross School of Business. He served as President of the Kinesiology Student Government and as the Publicity Chair for the Student Campaign Committee - the student committee for the Victors for Michigan capital fundraising campaign. Tyler's hobbies include cooking and trying new dishes, cheering on the Detroit Lions, Detroit Tigers, and University of Michigan football and basketball teams, as well as travelling with his wife, Ashley. Drew serves as a Corporate Account Executive for the Loons. Specializing in corporate hospitality and employee events, he focuses on developing new business, building long-lasting relationships and sharing his passion for Loons Baseball. His time in baseball has been spent in Jupiter, Florida as the Box Office Manager with the St. Louis Cardinals and Miami Marlins Spring Training home, as well as their two Minor-League affiliates at Roger Dean Stadium. Drew has also worked in O'Fallon, Missouri as the Director of Sales for the River City Rascals of the Frontier League. Drew currently resides in Mount Pleasant with his wife, Alyssa and son, Bennett. Drew is a Central Michigan University grad with a Bachelor's of Arts in Recreation, Parks and Leisure Services Administration with a concentration of Commercial Recreation and Facility Management, and minors in Hospitality Services Administration and Event Management. Andrea Noonan serves the Executive Chef as a part of Professional Sports Catering Powered by Levy Restaurants. She oversees the kitchen staff and constructs the stadium menu and while preparing food for all events and Loons games at Dow Diamond. Andrea has served in a variety of roles since 2010. She was the Director of Food and Beverage for the Loons during which time she provided support to the team's concessions staff and picnic area - which feeds over 600 people - while providing expert support and guidance for the kitchen staff of the State Street Restaurant. In 2011, she was also a concession supervisor for the Dow Event Center. Andrea is a graduate of Johnson and Wales University where she earned a degree in Food Science. During her collegiate years, Andrea was awarded a full year of tuition and schooling through Skills USA. After graduating, she worked on the catering staff at Shari's of Willard Hilton in Auburn. Andrea's love for culinary has taken her from using Big Bird eggbeaters as a child to participating in an Iron Chef Competition as an adult. Andrea was born in Essexville, Michigan and attended Bay City All Saints High School. She is now engaged and residing in Midland. Her hobbies include karaoke, bowling, gardening vegetables, and of course, cooking. Andrea's favorite dish to make is lasagna. Jerry O'Donnell serves as the Director of Production and Operations for ESPN 100.9-FM (WLUN). In addition to this role, Jerry is the public address announcer for Great Lakes Loons home game and is well known as "The Voice of Dow Diamond". He has held this position since the Loons inaugural season in 2007. A fixture of Mid-Michigan radio since 1987, O'Donnell's voice has been broadcast on six of the world's seven continents. Jerry has made an effort to be involved in the community, volunteering as a celebrity auctioneer and master of ceremonies for local charities. Jerry grew up on a small farm near Interlochen, Mich., before graduating from Benzie Central High School. O'Donnell studied at Northwestern Michigan and Northwood University. When he is not announcing Loons games or working in the studio, he enjoys spending time at his sons' sporting events. He lives in Midland and has three sons: Jordan, Jared and Trevor. Riley Paulus is a Group Sales Coordinator. In this role, Riley works with churches, schools and youth organizations in the scheduling of group reserved box and lawn outings. Riley joins the Loons after internships with the Triple-A Iowa Cubs and the Central Michigan University Athletic Department. Riley first attended St. Clair County Community College before receiving his degree in Sport Management from CMU. In his spare time, Riley has volunteered for Special Olympics of Michigan during his time in Mt. Pleasant. He has also worked with groups such as the Salvation Army, Kids against Hunger and various other groups during his time with the Boys Scouts. The Port Huron native enjoys hanging out with his friends watching CMU sporting events and is an avid fan of the Lions, Tigers, Red Wings and Pistons. His favorite sports memory is when the Lions made the playoffs for the first time in over a decade. For hobbies, Riley collects sports memorabilia and enjoys and playing sports. He is also an Eagle Scout. Sam PeLong works in the ticket office as a Group Tickets Sales Manager, where he works with churches, schools and youth organizations in the scheduling of group reserved box and lawn outings. Sam joined the Loons in 2015 where he served as a gameday Cash Manager for two seasons. In 2016 he served as an Event Coordinator for the Michigan Baseball Foundation and also assisted with gameday management and daily operations of the State Street Restaurant. Prior to joining the Loons Sam spent 25 years in management for two major retail electronics companies where he was recognized on two occasions for running the 'most profitable location' in the Detroit region. From 1987-91 he also served as a specialist in the United States Army, even standing on the Berlin Wall the day that it fell..
Sam resides in Midland and enjoys wood working, gardening, useless trivia, and traveling with his wife. Thom is the Assistant General Manager of Ticket Sales for the Loons. In this role, he is responsible for the daily management of all aspects of the Ticket Department. Through his direct association with all staff members of the Great Lakes Loons family, Thom helps to plan, promote and strengthen Michigan Baseball Foundation brand values of fun, family entertainment and service excellence. In addition to providing a professional, reliable and full-service ticketing operation, Thom helps to plan and facilitate the exclusive events for the Great Lakes Loons Founders Club Members. Being an active member of the Loons ticket sales management team, Thom is able to provide insight and personal guidance on matters of strategic planning, franchise leadership and organizational functionality. Thom comes to the Great Lakes Loons after serving in a number of professional capacities within the fields of business, education, and medicine. He prides himself in providing and modeling the very best customer service possible. Thom began his career with the Loons as a Ticket Sales Associate in 2014 before becoming the Director Ticket of Sales. Eric Ramseyer serves as the Director of Business Applications and Analytics for the Loons. In this role, he is responsible for the planning, implementation, operational support, maintenance, and development activities for organizational business applications and systems. In addition, he is responsible for accurate data collection, processing, and analysis to help the sales and marketing teams exceed sales goals. Ramseyer is a native of Bay City, MI and graduated with a Masters of Business Administration from the University of Michigan, Flint in 2016. He started working for the Loons as a Ticket Sales Assistant in the 2010 season and was a member of the full-time staff in various roles until November 2017. He returned to the Loons in December 2018 to begin this new role. Eric is an avid sports fan and played baseball and basketball throughout high school. He spends many fall weekends in Ann Arbor cheering on the Michigan Wolverines and spends additional free time playing rec basketball. Kelly Rensel serves as the Head Groundskeeper for the Loons. He supervises all aspects of the day-to-day operations of the playing field at Dow Diamond, and all aspects of grounds maintenance on the entire property. Prior to joining the Loons, Kelly was the Head Groundskeeper for the Greenville Astros for two seasons, as well as the Head Groundskeeper for the Huntsville Stars for four years. In 2009, he was the Head Groundskeeper for the Idaho Falls Chukars and got his baseball career started in 2008 as a Grounds Crew/Stadium Ops intern with the Mahoning Valley Scrappers. In 2014, Kelly received the recognition of Appalachian League Sports Turf Manager of the Year sponsored by the Sports Turf Managers Association (STMA). He has also spent time working at the Southeastern Conference (SEC) Baseball Tournament. Kelly is a Certified Sports Field Manager (CSFM) by the Sports Turf Managers Association (STMA). He also was the winner of the 5th annual STMA Mowing Pattern contest in 2017. Kelly received a B.S. in Sport Administration from Edinboro University of Pennsylvania in 2009. A native of Erie, PA, he resides in Midland. Rickey Rissman works in the ticket office as a Group Sales Coordinator. In this position, Rickey works to provide churches, schools, and youth organizations with their ideal reserved box or lawn outing. Rickey joined the Loons in 2018 as a Gameday Assistant. As a GA, Rickey worked at the ticket windows, guest services, and many other areas throughout Dow Diamond. Prior to joining the Loons, Rickey was the ticket office intern with the Wisconsin Rapids Rafters in the Northwoods League. Most recently, he was a Team Leader at the ROCK Center 4 Youth Development where he worked with middle and high school age kids in order to provide guidance and teach life lessons. A fun fact about Rickey is that he is faster than 80% of all snakes. Rickey is a proud native of Warren, Michigan as well as an alum of Northwood University. Alex Seder is the first Director of Creative Services in the team's history, serving as the in-house graphic designer for all of the MBF and MBFE properties (Loons, ESPN 100.9-FM, State Street, MBF), as well as team photographer. Alex joined the Loons in 2017, coming from the world of freelance design. He spent the previous three years working with diverse clientele, ranging from local advocacy groups to multinational wealth management firms. Alex brings a unique combination of passion for creative design and passion for baseball. Alex resides in Midland, where he spends his free time watching movies, enjoying Italian food, and rooting for the Tigers, Lions, University of Michigan, Liverpool FC, and, of course, the Loons. Holly Snow serves as the Accounting Manager for the Loons. Holly's job duties include accounts payable, accounts receivable, reconciliation of ticket sales and various other financial responsibilities. Holly joins the Loons after working with the Dow Chemical Company for 19 years. During her time at Dow, Holly worked in cost accounting. She attended Midland High before going on to Northwood University where she earned a degree in business administration. Holly volunteers as the treasurer for local Cub Scout Pack 3791. In her free time, Holly likes to do anything outdoors, especially boating or on the water with family and friends. She also likes music, reading and going camping. Born in Midland, Holly also resides here with her husband Terry, and boys Blake and Chase. Jamie Start serves as the Director of Accounting for the Loons. She is responsible for overseeing accounts payables for all companies, as well as financial responsibilities associated with ticket sales, special events and payment receipts for the Great Lakes Loons. After starting as a finance intern in March 2008, Jamie was hired as a full-time employee for the Loons in August of that year. Jamie is from Midland and is a Bullock Creek High School graduate. She attended college at Northwood University, majoring in accounting. In her free time, Jamie enjoys the outdoors and spending time with her family. Jamie, her husband Brett and their daughters, Kyleigh and Baylea, currently reside in Midland. Dan Straley serves as the Assistant General Manager of Facilities. Straley oversees the day-to-day operations of Dow Diamond for games and other events. This includes managing part-time and full-time staff, supplies, facility and grounds operations, set-up and clean-up for events, preventative maintenance, and relationships with the Loons' key vendors. The Midland native served as the Stadium Operations Manager and Director of Facilities and Operations for five years prior to his current role. Dan has worked as an Equipment Operator for the City of Midland, managed local bands and freelanced as a graphic artist. He holds an Associate's Degree in Electronic Graphic Design from Delta College, which he received in 2008. Straley lives in Midland with his wife, Jan, and daughter, Caitlyn. He enjoys playing disc golf, which he once did professionally, is a decent blues harmonica player and he enjoys spending his free time attending concerts around the country. Ryan Teeple serves as the Catering Manager as a part of Professional Sports Catering Powered by Levy Restaurants. He oversees all catering operations on the suite level during games and during special events at Dow Diamond, such as parties, banquets, fundraisers and business meetings. From 2011-2013, Ryan worked for the Loons in the Suites and Events. He's worked in restaurants and banquet facilities at the Meadowbrook Country Club, the Holiday Inn, and Holiday Inn Express and at the Soaring Eagle Casino and Resort. Most recently before joining the Loons, he worked for the Detroit Lions as a Suite Supervisor from 2014-2015. Ryan is from South Lyon, Mich., and is a 2010 graduate of Central Michigan University where he majored in commercial recreation and facility management with a minor in hospitality. He enjoys spending time with family and friends along with playing and watching sports. Ryan's favorite sports memory is winning the league championship in soccer at South Lyon High School his senior year. Brad Tunney serves as as a Play-by-Play Broadcaster for ESPN 100.9-FM announcing Loons games, along with describing high school football and basketball and Northwood Basketball to listeners. Brad also serves as the program manager for the only all-sports radio station in the Great Lakes Bay Region. Brad graduated from Central Michigan University with a bachelor's degree in Broadcast and Cinematic Arts, with a minor in Electronic Media Sales. He was a play-by-play broadcaster for the Loons during the 2015 and 2016 seasons, while also spending a portion of the 2016-17 season as a member of the Grand Rapids Drive broadcast team, the D-League affiliate of the Detroit Pistons. Born and raised in Clinton Township, Brad's favorite sports memory is the Pistons winning the 2004 NBA Championship. When he's not at the ballpark or on the radio, Brad enjoys watching sports, spending time with his parents and traveling to cities he's never been to before. He also enjoys playing golf and drinking craft beer. Carol Van Wert serves as the Executive Assistant to the President and Founder in the Michigan Baseball Foundation office. She also has an active role in the MBF grant process. Carol spent 15 years with The Dow Chemical Company before joining MBF. Born in Detroit and raised in Ossineke, Mich., Carol graduated from Alpena High School and attended Baker Junior College of Business. Apart from spending time at Hubbard Lake with family and friends, she loves any kind of outdoor activity including walking, gardening, boating, to name a few. Carol is a big baseball fan and loved watching her three sons (Tyler, Reid, Nolan) play when they were growing up. Carol's pride and joy are her sons and their families, including five beautiful grandchildren! Carol and her husband Eric have a Bernese Mt. Dog named Bella and a cat, Parsnip. Carol is an active member of New Life Lutheran Church in Spruce, Mich., and Trinity Lutheran Church in Midland. Joe Volk serves as a Corporate Account Executive for the Loons. In this role, he manages new corporate accounts by generating leads, working with businesses to identify client hospitality and employee engagement needs, and presenting solutions to meet those needs. Joe joins the Loons after a 30-year career in radio as an account executive and morning show host. Joe lives in Midland with his wife, Angela, who is way better looking than he is. He has twin sons who both attend Michigan State University, who are way smarter than he is. Joe attended Central Michigan University and graduated with a Bachelor's of Arts degree in broadcasting. He enjoys working out, reading, and chasing his dogs. Tiffany Wardynski is the Vice President of Baseball Operations and Gameday Experience. In this role, Tiffany oversees all elements fan's experience when they attend a game at Dow Diamond. She also manages team travel during the season. She has served in many roles within the Loons ticket office, which she joined in 2009, ranging from the management of group sales to advanced ticket operations. Before taking a full-time position with the Loons, Tiffany served as a business operations intern for the team in 2008. She is from Bay City, Mich., and graduated from John Glenn High School. Tiffany graduated from Central Michigan University in 2008, majoring in sports management while receiving a minor in marketing. In her free time, she enjoys sports, shopping and spending time with her family and friends.